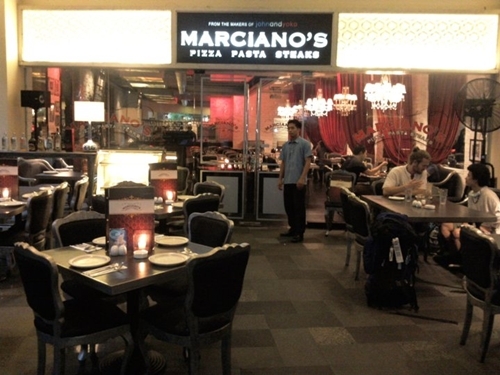 Marciano's is an Italian-American restaurant located in Greenbelt 3. Their food items have creative names inspired by old Hollywood glam. Note: It's not my habit to bring a camera when I go out, so as with previous posts, the pictures used here are official photos, taken from the restaurant's Facebook page. I hope to change this habit in the future. We sampled three of Marciano's dishes - Blair Waldorf 4 Cheese and Sausage Risotto, Tenderloin with Foie Gras, and Astoria Pork Medallions with Mashed Potatoes. The risotto was very rich. You feel the umay factor early on. I wasn't sure if it was due to the oil used or due to the abundance of cheese. The Pork Medallions and the Tenderloin were both good, though. They were tender and moist. Loved the foie gras! 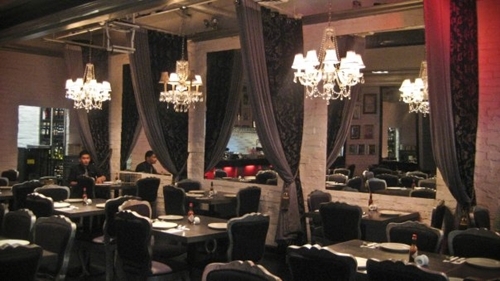 Some of Marciano's food are affordable, some are a bit pricey. So it's up to you and your budget. The restaurant is very aesthetically pleasing. I doubt anyone would disagree. The decors and furniture are elegant. 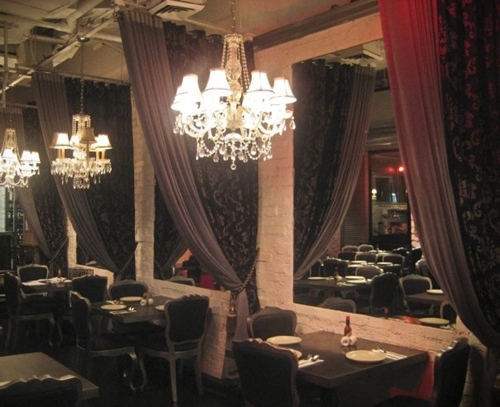 The curtains and the chandeliers add a great touch to the interiors, really classy. 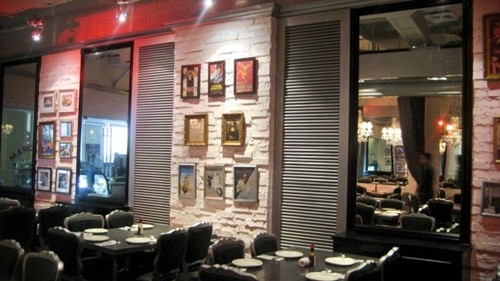 Framed artwork pieces are lined up on a brick wall on the opposite part of the place. The two sides are a little bit in contrast but the contrast works. There are a lot of mirrors in Marciano's. You'll probably catch yourself checking yourself out (or perhaps another good-looking diner) several times during your stay (don't worry, the mirrors and the lightning are all flattering). These huge mirrors on the opposite walls open up the place, making it look more spacious and inviting. The curtains on one side, meanwhile, provide a nice contrast by enhancing the feeling of privacy and intimacy on the nearby tables. If there's one thing about the interiors that I don't like, it's the ceiling. I'm not a fan of open ceilings. I don't even know what they're called. I just don't like seeing exposed pipes unless I'm in an industrial place. That style seems to be popular though since it makes spaces look bigger. 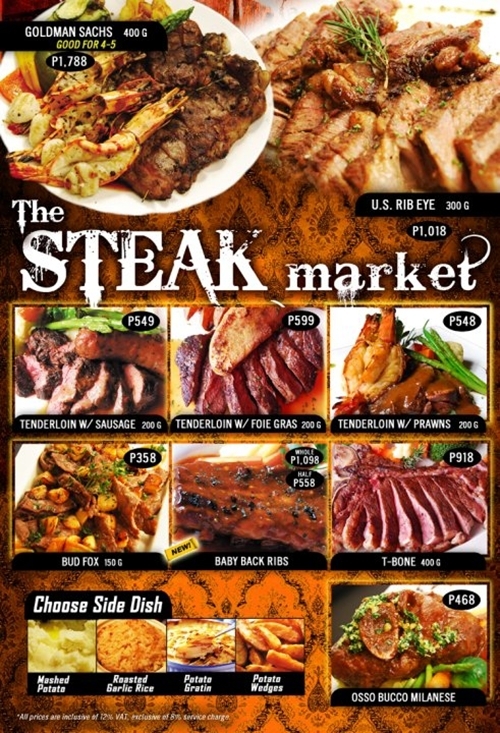 If you'll search the Net, you'll find several negative reviews about the service in Marciano's. During our first visit, the servers seemed a bit cold compared to other restaurants'. But since the restaurant looked upscale, my companion and I wondered if the staff were in fact trained to be a little distant (ala the stereotypical snobbish waiters in upscale French restaurants) instead of being all-smiles and chatty. Anyway, our food did not take long to arrive and we did not experience any rude behavior from the staff so all was well. 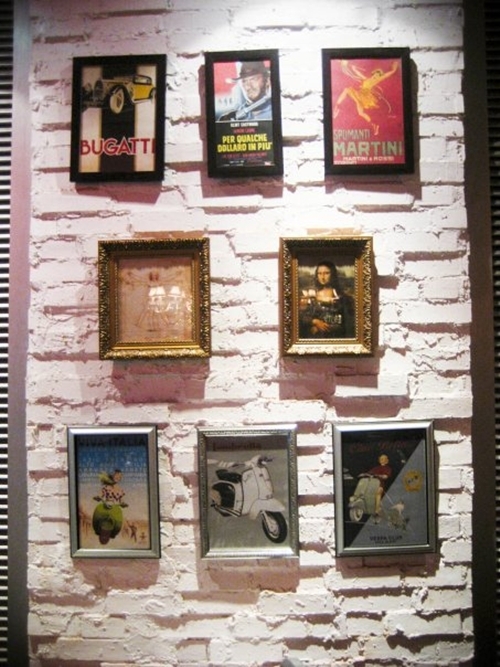 By the way, as you can probably see from the above pictures, Marciano's has a great-looking menu. All their food items have big, appealing pictures. I wish all restaurants would have such menus. It's a great help for customers when we know what we're ordering. I'm sure the restaurants would benefit as well since customers would be tempted to order more. One last thing. Both times when we were at Marciano's, their TV was playing Breakfast at Tiffany's without sound. I don't get the logic of playing a movie or even a TV show without sound or subtitles. If you don't want the noise, please enable the subtitles. It was also a little weird to see the same movie during those two visits, with the movie skipping during our second visit. For a restaurant owned by an actor (Marvin Agustin), it was a bit ironic. i also don't like how 'functional ceilings' look ill-finished with all the bare pipes. i mean c'mon, they could have just made a decent ceiling of sorts, especially with all those chandeliers hanging. The bare ceIling is an eye catcher and not a nice sight.I like to try the rissoto. You're right. It's functional and probably aesthetic to some. Just didn't appeal to me. Ugh, I hate the umay factor. It ruins my appetite even for food items on the table. "Breakfast at Tiffany's" is a nice movie, but the Marciano's staff should have played other movies. I agree. It's definitely a plus for me when servers look like they are happy to see you. Looks great! This is one my dreams! to be able to hop to different great restaurants! Marciano, sounds sosyal. 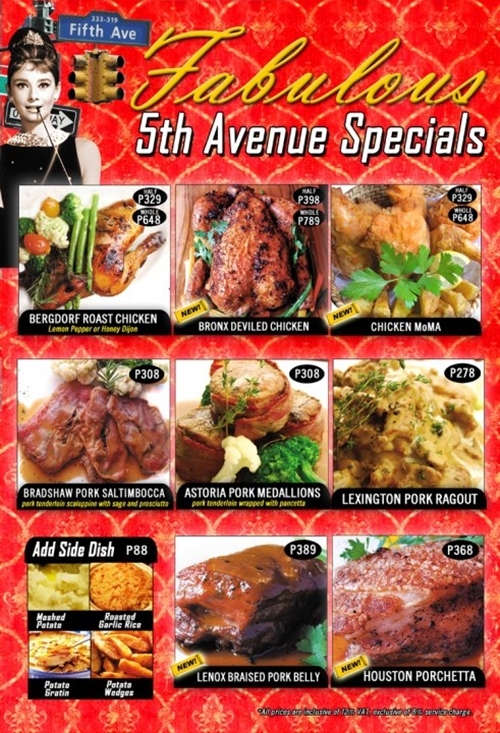 Anyway, since they also offer budget meals, bet ko 'to. LOL! The place looks classic and the foods truly tempting. Soon, I'll be there! 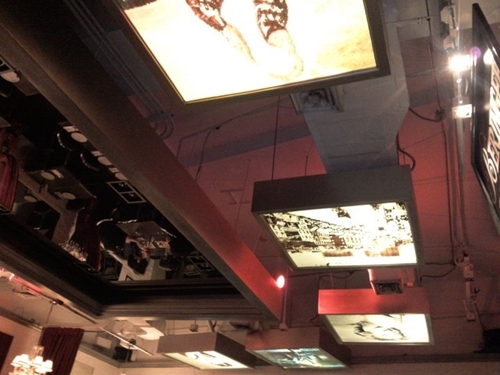 I think the ceiling is not appropriate to the ambiance that they are trying to convey. Anyway I am interested with their paella, just one of my favorite dish. 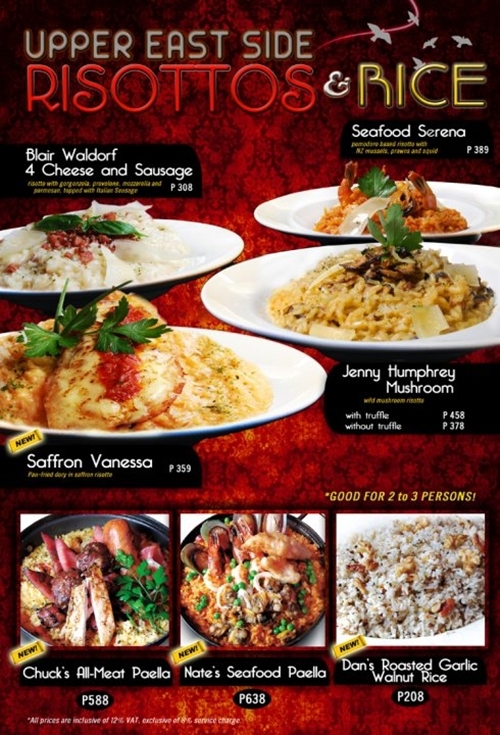 I like paella too, but haven't tried Marciano's version. 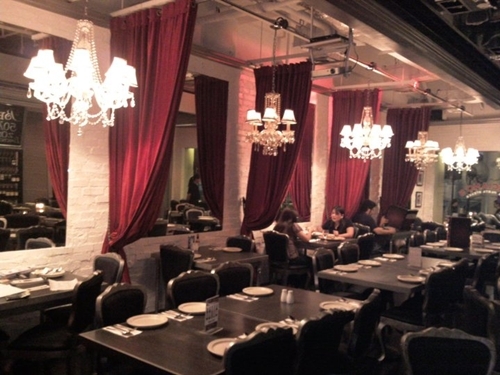 wow restaurant na restaurant tlga ang dating :3 just like what i see in movies <3 i'd love to dine in one . I'm just guessing but I think it's to make the resto's ceiling appear higher and thus make the resto look bigger and the chandeliers grander. The foods look yummy and... oh, pricey. Well, if the taste could justify the cost, it's not a problem. As the cliche goes, quality is never cheap. the interior looks really nice. Looks like an interesting place to sit and eat and chillax...the food are truly tempting and i could imagine myself burping with all all these beautiful table temptations. wow, mukhang masarap ang food kaya lang medyo nakakailang, mukhang mahal... lol. love to try it though. Yahweh bless. ignore the price for as long as we are satisfied. food and service is great!